System accommodates a wide range of drum sizes for future process flexibility. Drum filler is approximately 36” square x 72” high. 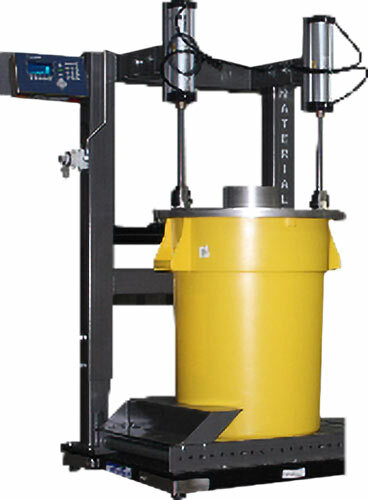 Drum filler base includes a gravity roller conveyor. Filler base conveyor features a drum centering guide to ensure drum alignment for proper sealing. System includes a 10’ long gravity roller discharge conveyor with floor supports for 6” TOR elevation. Drum fill head constructed from 304 stainless steel, all welds continuous TIG. Fill head includes an 8” diameter inlet stub and a 4” diameter dust take-off stub. Robust tubular carbon steel frame construction. Carbon steel cleaned, then painted with USDA approved Steel-It™ epoxy system. Unit includes a Mettler Toledo carbon steel platform scale system. Mettler Toledo digital weight terminal with Ethernet/IP PLC interface module to communicate with customer’s existing PLC.